While the Cannes Film Festival and the Venice Film Festival vie for the title of the glitziest film festival in Europe, the Taormina Film Fest in Sicily has the most spectacular setting for watching a film. From your seat in the 2300 year-old Greek theatre with the Mt. Etna volcano as a backdrop, you experience the same setting as the ancient Greeks (okay, the Romans later messed up the original just a bit) and can sense the idea of comuning with the gods. If nothing else, it’s great way to spend a summer’s evening, and if Mt. Etna is in one of its eruptive phases you can see the lava flow glowing red against the night sky. 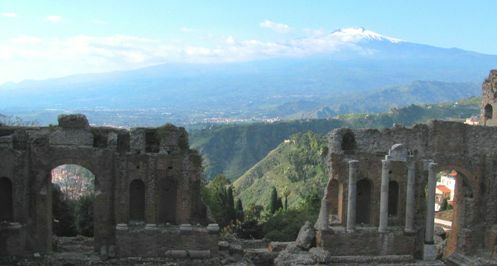 2009 marked a turning point in the 55-year history of the Taormina film festival, as it was re-launched as the Taormina Film Fest in Sicily, with international film screenings not only in Taormina, but in 3 other Sicilian towns. By adding cinema in Palermo, Syracuse, and Palma di Montechiaro, more viewers across the island will have access to the festival than ever before. Films range from world premiere Hollywood movies to arty films from around the world that rarely come to your video store. Details: The Taormina Film Fest takes place in mid June. Check their website www.taorminafilmfest.it for exact dates and screenings. Summer is high season in Taormina, so hotel prices can be shocking. Stay in the upper town at Villa Carlotta, a 4-star boutique hotel with outstanding service, or try for one of the few rooms at the intimate TaoDomus, like staying in a welcoming Sicilian home.